Backyard barbecues are a popular way to spend weekends in Canada and with Canada Day coming up, there’s even more reason to bust out that barbecue. What better way to celebrate Canada’s 150th than with family, friends and delicious appetizers, like these Grilled Pear Crostini Bites. There are three things in life that my palate enjoys most, honey, bread and CHEESE. Anyone who knows me knows I cannot get enough cheese; cheese practically goes well with everything, am I right? I have been known to eat a slice or two while making recipes but my favourite is a sharp, slightly salty and creamy texture and Armstrong® Havarti cheese hits the mark every time. We’re in the home stretch for the end of the school year, a lunch box marathon break and warm summer days perfect for backyard gatherings; I cannot wait! We love enjoying the outdoors and barbecue as much as possible in the summer months but let’s be honest, we are Canadian and the snow doesn’t stop us getting our grill on. Backyard barbecue gatherings are a good way to celebrate the end of a school year, the end of hectic schedules and reconnect with family and friends. At the heart of every great gathering is a spread of delicious food so your guests return home with bellies and hearts full. 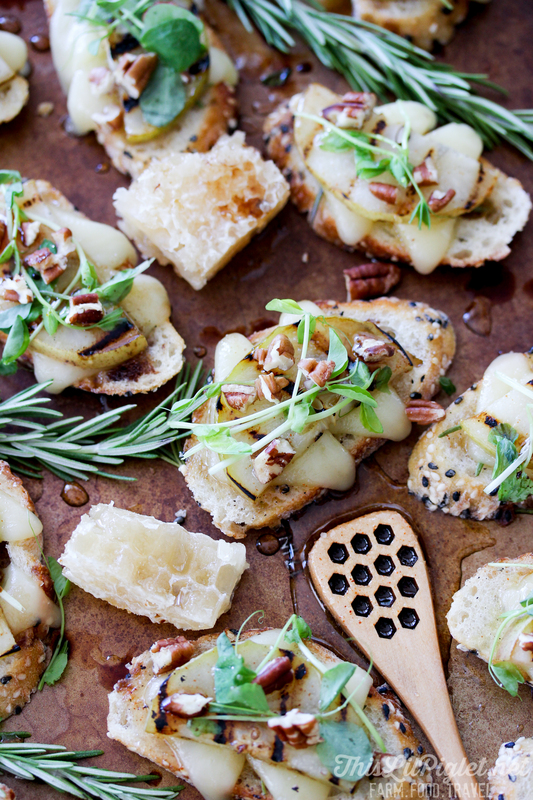 Grilled Pear Crostini Bites with Armstrong® Havarti cheese and Honey Pecan Drizzle will be a favourite at your next barbecue; trust me on this one. The flavours, texture and premium quality satisfy my undying love for cheese every time. It’s a Canadian brand that has been around since 1902, it has all the natural goodness you need and is a good source of calcium and protein , like the way cheese artisans made it years ago. The block cheese is the perfect square size to slice for crackers and the sliced cheese is the perfect sandwich size. Monterey Jack with Jalapeño – This melted on bratwurst sausage with sauerkraut…oh, HELLO! Garlic and Herb – Imagine this shredded on a baked potato. Drooling! Havarti – Beyond these Grilled Pear Crostini beauties, Havarti perfectly pairs with crackers for a picnic snack…and wine. If you don’t know what Crostini is, like my husband (cough), it’s an Italian appetizer of small slices of grilled or toasted bread and delicious toppings. In this case grilled pear, Havarti cheese, pea shoots, toasted pecans drizzled in honey and a touch of balsamic vinegar. 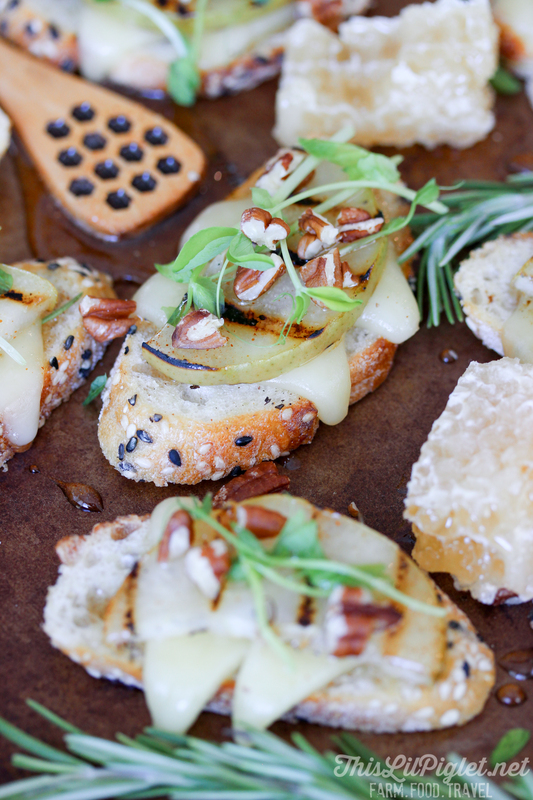 These grilled pear crostini bites are sweet with a touch of sharp melted Havarti and a hint of heat. Each level of flavour balances the other for a summer fresh appetizer. 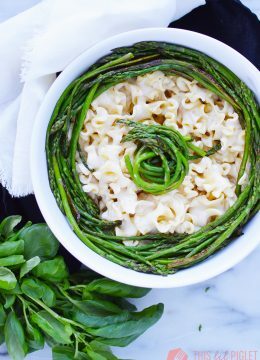 Inspire your cheese loving self with more delicious recipes at armstrongcheese.ca and make sure to check out the Armstrong® Facebook Page. To purchase, you can find Armstrong® cheese in grocery stores throughout Canada. 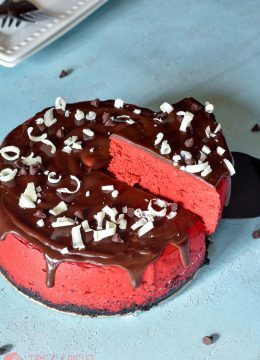 If you like this recipe, let me know your thoughts in the comments below. 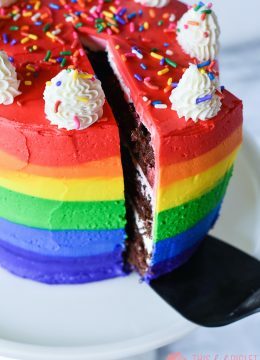 Please check out my other recipes and I’d love if you’d pin it for later on Pinterest or follow along for other great recipes on Facebook, Twitter and Instagram. Slice bread into ½” slices on an angle; place on a baking pan. 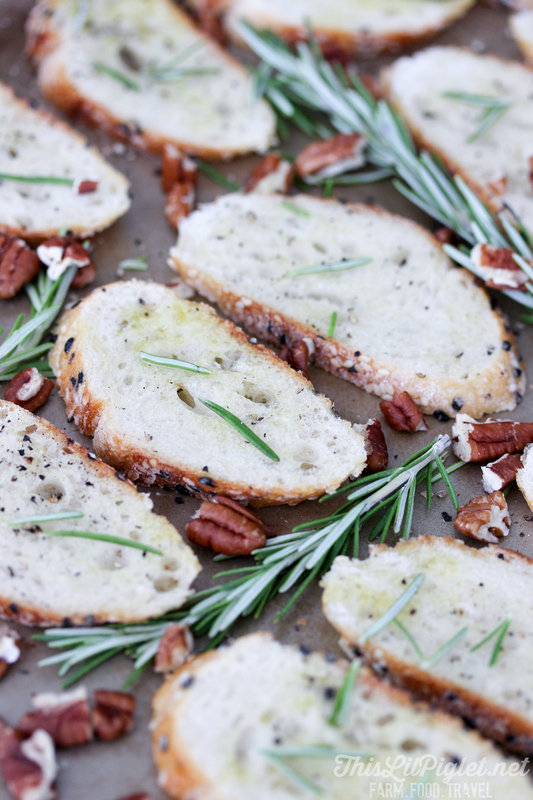 Brush with olive oil, sprinkle a small amount of Rosemary over the bread and lightly pepper using a peppercorn grinder. Place Pecans on the end of the pan Broil for 1-2 mins or until crostini are golden brown and pecans are toasted. In a small bowl, place honey, garlic and cayenne and mix well. Set aside for assembly. Slice Armstrong® Havarti cheese into ¼” slices then cut each slice in half and again in half to make quarters/triangles. Set aside. Slice the pears horizontally into ¼” rings, discarding the stem and bottom then slice in half and set aside. In a grill pan or on the barbecue, grill sliced pears approximately 2 mins each side to sear. Set aside for appetizer assembly. Place two quarters of the Armstrong® Havarti cheese slices on each toasted crostini and place back into the oven to broil for approximately 1 minute or until cheese is slightly melted. Assemble all appetizers on the serving plate you intend to use by topping each melted cheese crostini with a slice of grilled pear, pea shoots and pecans. Drizzle each with spiced honey and a small amount of balsamic vinegar before serving. Best served warm but can be served cold. 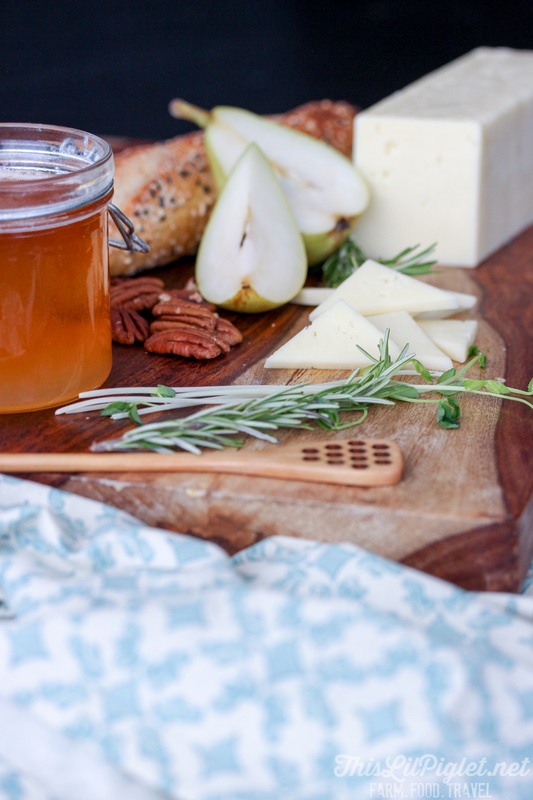 To avoid wilting the pea shoots, cool the cheese and pears completely before assembling the remaining toppings. 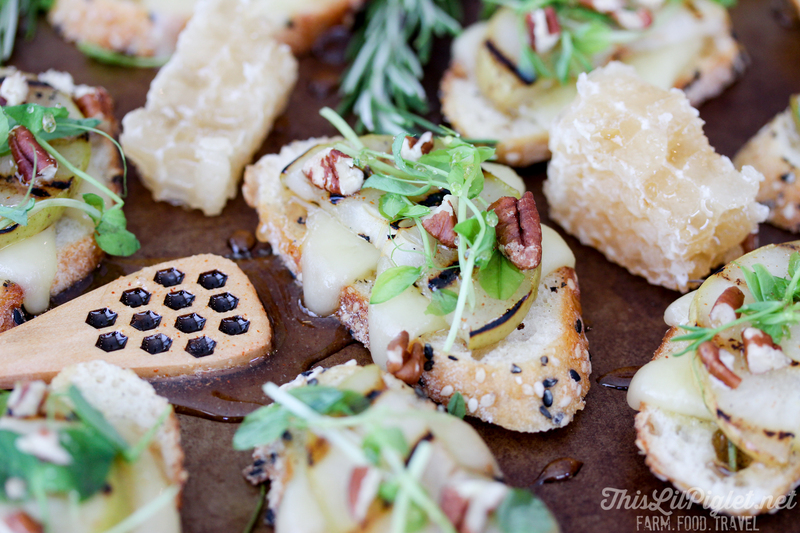 Disclosure: This recipe of grilled pear crostini appetizers has been sponsored by Armstrong® Cheese. All opinions are my own.